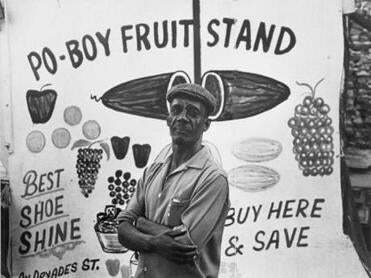 Works by Leonard Freed on display in “Black in White America” at the Clark Gallery include “Po Boy Fruit Stand, New Orleans” (below) taken in 1965 and “Harlem” (pictured) taken in 1963. LINCOLN — Leonard Freed (1929-2006) photographed many subjects: Jewish life in Germany, the Yom Kippur War, New York police, Poland, post-Franco Spain, Asian immigrants in Britain, North Sea oil workers. So wide-ranging a list indicates a restless curiosity, as well as an attraction to matters of substance. Both qualities inform Freed’s best-known body of work, on race relations in ’60s America. That work resulted in a classic book, “Black in White America” (1968). An extensive sampling of images from the book and others considered for it are on display at the Clark Gallery, in Lincoln, through March 1. There are 21 vintage black-and-white prints hanging on the walls. Even more interesting are another two dozen photographs in portfolios, the book maquettes Freed put together, and a binder of contact sheets. “Archival excitement” sounds like an oxymoron. Who knows, maybe it is. But archival excitement is what this show has to offer. Many fine photographers documented the civil rights movement, from little-known photojournalists to such now-famous practitioners as Bruce Davidson and Danny Lyon. Freed’s work stands apart. For one thing, it’s less about a movement than the society that movement represented. Context is too dry and abstract a term for what Freed was after, but it’s close enough. True, there’s a photograph of a demonstration here, and it’s the most famous one of all, the 1963 March on Washington. Yet how Freed shot it suggests how he went about his business in “Black in White America.” The Lincoln Memorial Reflecting Pool, the dominant visual element, is shown well off center. That’s not what you’d expect. The expected tended not to draw Freed. It was things harder to capture — and explain: individuals not crowds, interaction not confrontation, society not politics. Except, of course, everything felt political back then. The most seemingly innocuous scene could be a racial statement: a beauty pageant in Harlem, a science lesson at a traditionally black college, a bare-chested boy flexing his biceps, another boy’s wary stare. Nearly all of these images have people in them. It’s the human element that Freed’s after: young and old, rural and urban, poor and middle class. Occasionally the people are white, which is as it should be. Then, no less than now, there were white people in black America, as well as vice versa. One might argue that Freed was practicing a sort of visual anthropology, though insofar as that makes “Black in White America” sound a bit bloodless and pedantic, such a description would be wrong. Visual anthropology is definitely what’s going on in Chris Rainier’s “Where Masks Still Dance: New Guinea.” That show also runs through March 1. Documenting indigenous peoples has been Rainier’s abiding concern. 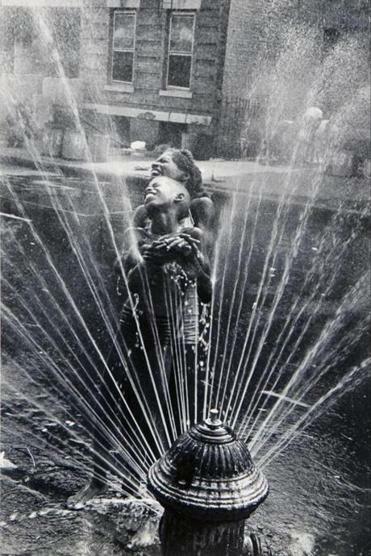 The 17 photographs here are informative, respectful, chastely lyrical. Their being in black and white adds to the sense of exoticism. Rainier has a fine and subtle eye. You can see it in the way a tribesman’s headgear resembles the roof of a hut behind him, or the visual interplay of mangrove roots and ceremonial costume. Rainier’s especially skilled at the sculptural presentation of bodies and objects in space. Literally as well as figuratively, he wants to show these people in depth. He seeks to put an entire world on display. That world may be highly limited in extent but overwhelming in its timelessness. That’s one reason it looks so surreal to us. Imagine, though, how surreal ours must look to them. Rainier is scheduled to give a lecture at the gallery on March 1.